At least one person died near the city of Teramo, and another went missing after an avalanche occurred near L'Aquila, both in the Abruzzo region, Ansa news agency reported. The first 5.3-magnitude temblor on the Richter scale struck at 10:25 a.m. local time (0925 GMT), according to Italy's National Institute of Volcanology and Seismology (INGV). It was registered at a relatively shallow depth of 9 km. The second quake carrying a magnitude of 5.4 hit at 11:14 a.m., the third one measuring 5.3 struck at 11:25 a.m., and the fourth 5.1-magnitude one at 2:33 p.m.,respectively at local time. 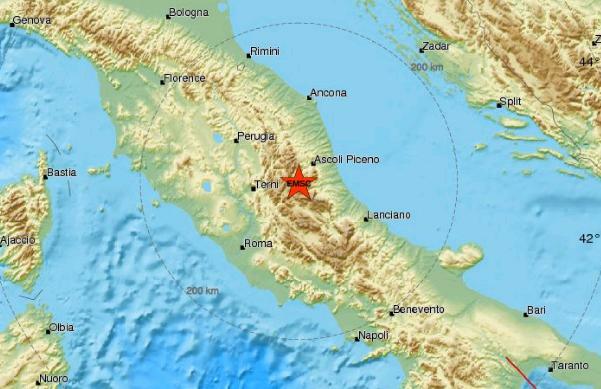 The epicentres of the temblors were registered between the provinces of Rieti and L'Aquila, the INGV stated. The medieval city of L'Aquila, largely destroyed by a quake in 2009, did not suffer major damages this time. More than 100 aftershocks were registered in between these main events, according to the Institute of Seismology. 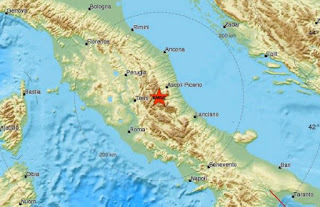 The major quakes were clearly felt all across the central regions of Abruzzo, Marche and Lazio. The earth trembled as far as in the Italian capital, some 110 km west, where most schools were closed, and the underground subway temporarily evacuated in the morning. No damages were reported there. The victim so far registered was an 83-year-old man, whose body was recovered from the ruins of a building in Castel Castagna that collapsed due to both the quakes and heavy snow, the Civil Protection Department said. A second man of 60-year old was missing as of Wednesday evening, and rescue teams feared he might have been buried under a snowslide in the village of Campotosto, where also the city hall's roof collapsed due to the tremors. A woman and her child were rescued from the rubbles of a collapsed house also near Teramo, according to Ansa. One of several structures still standing in Amatrice, the bell tower, collapsed on Wednesday. The little town had already been levelled by a 6.0-magnitude quake on Aug. 24 that caused some 300 deaths overall. Two major temblors followed on October 26 and October 30 last year, destroying much of the historical heritage of those regions, and forcing thousands of people to live in tent cities, temporary houses, or trailers.